As much as your child may protest, eventually the summer will be over and it will be time for them to get back to school. With the new term, comes lots of new equipment! Stationary, uniforms, jackets, shoes, school bags… Where does it end? Perhaps the most important item on the list is the school bag. It can be hard picking school bags – you have to find the perfect balance between style and functionality. There is no point in your kids having the latest trendy bag if it is going to fall apart as soon as they overload it with textbooks. So here is a rundown of exactly what to look for when buying a school bag that will keep all parties happy. What Kind of Backpack Do I Need? When shopping for their new school backpack, there’s a few things that you might want to consider. •	Should it be a rucksack-style with two straps? •	Is a one-strap shoulder/messenger-style bag big enough? •	Colour? Or keep it timeless with black to keep it for longer? •	How big should it be? •	How heavy should a school backpack be? Luckily, we have the answers to those questions. School bags are often ridiculously overloaded. As soon as your kids hit high school they can have up to 8 textbooks to carry around at any one time, so make sure you get a bag that is roomy enough to fit that many, plus their pencil case, calculator, lunch and other essentials. Next check that the bag matches your kid’s size. If your child is 12 and you buy them an adult’s backpack, it is going to be far too big for them. This will cause them to fill it just for the sake of it, making it unnecessarily heavy. How Many Litres is a Regular School Backpack? Look out for a label on bags that shows the content size in litres. This will give you a good indication of how much you can actually fit in it, as often backpacks and satchels vary in their capacity. A bag that is 20-24 litres should always do the trick. Although, it should be noted that this most likely won’t be needed by the kids in their first three years of school so you can opt for the smaller, quirkier bags then. How Heavy Should A School Backpack Be? Bags should never be heavier than they can handle and there are ways to ensure they never feel overwhelmed by the weight. For students with many books to carry, we recommend two-strap bags and, going one step further, advise that the straps are wide. This way, they will be able to carry the weight on their whole body rather than putting undue strain on their back. If they are determined to get a shoulder bag/satchel then, similarly, ensure that the strap is as wide and long as possible. If there is enough length, they will be able to wear it across the body and avoid straining just one shoulder. Just because a bag is practical, doesn’t mean it has to be boring and unstylish. Kids can be more obsessed with looks and style than making sure it’ll actually hold all of their belongings and support them while doing so. Make sure you pick out the best style for them, which will also keep you happy. The top two choices are either, satchels or backpacks. Both are classically stylish options, which will also work practically. If you want to go for a more practical backpack style then pick a fun bright colour, as this will appeal to younger kids. Plus you’ll be able to spot them easily when you go to do the school run! 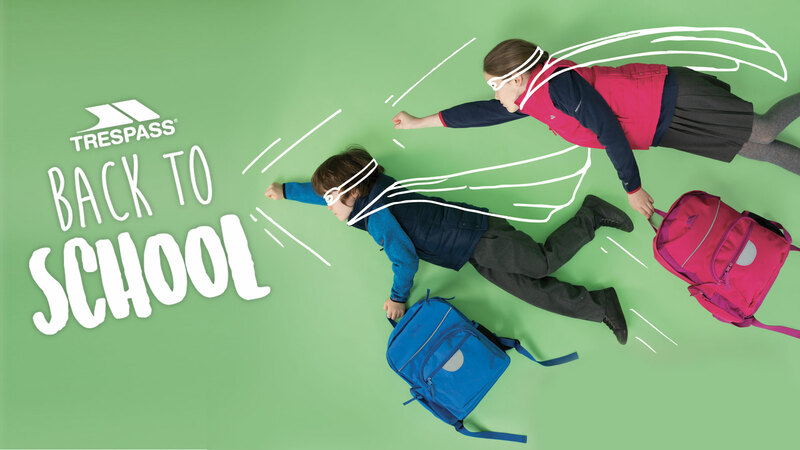 Trespass have tons of different styles of backpacks, rucksacks and more from the kids to choose from when it comes to school time! Check out our Back to School range, which is updated whenever newbies come through so they can always choose from the best.